The first impression of the Ricoh Theta 360 Degree Spherical Panorama Camera is its odd appearance — to me it feels like a bar of chocolate wafer. The dual lens reminds me of the bubble eye goldfish. 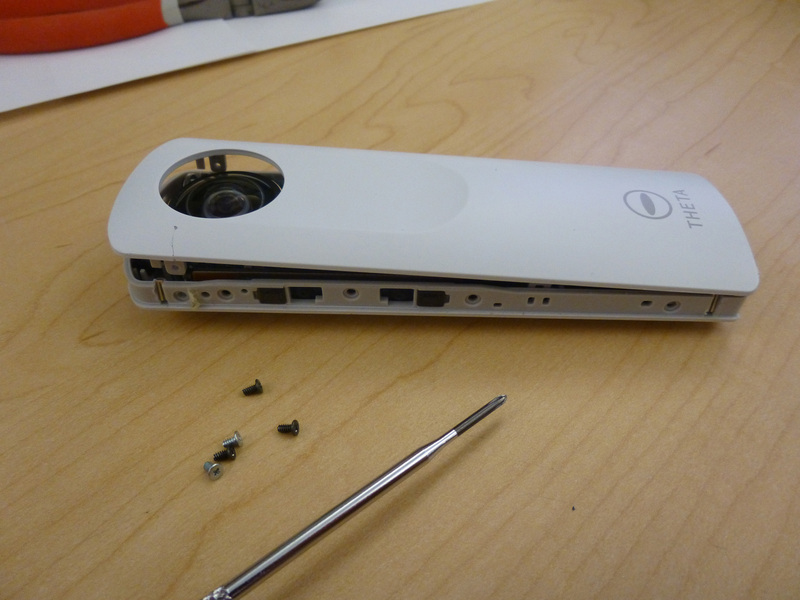 For some reason I was given this 1st generation Ricoh Theta camera for free, but broken. So why not taking a peak at its inside? 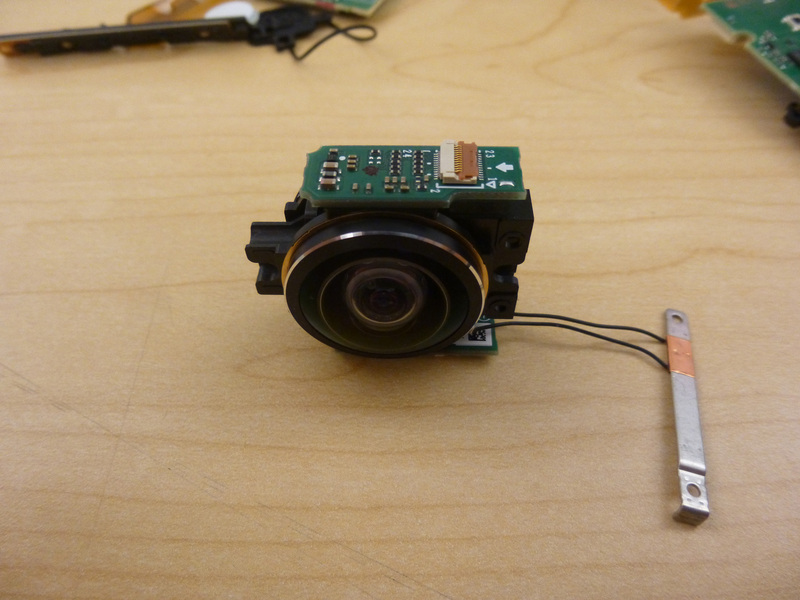 The camera was wrapped with aluminum straps by double-sided tapes to cover the screws. Removing the straps would expose the screws. And that would be the starting point for the teardown. There were quite a few screws on the sides. Once they were all gone, the cover popped up easily. 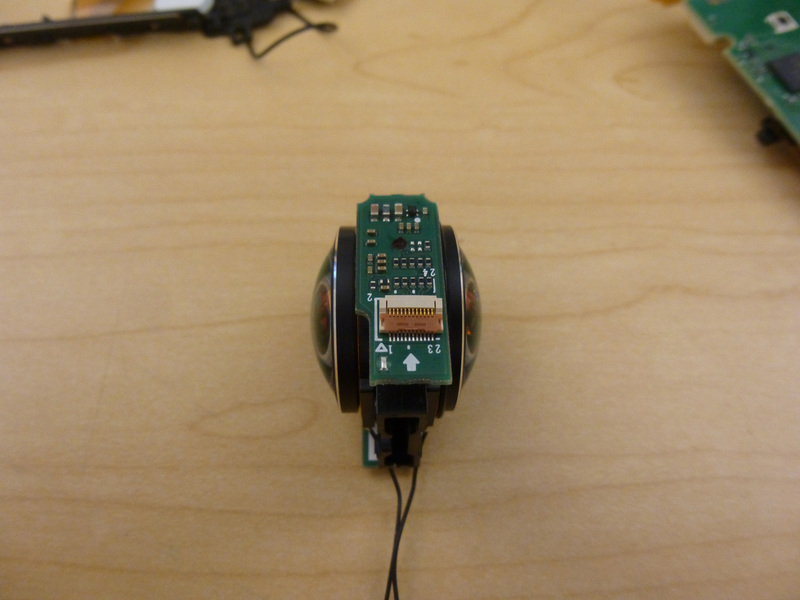 Now you can see what’s enclosed: battery; circuitry and optical module. Looks like each section takes equal amount of space inside the camera body. The Li-ion battery (model: DB-100) is quite beefy, to be honest. 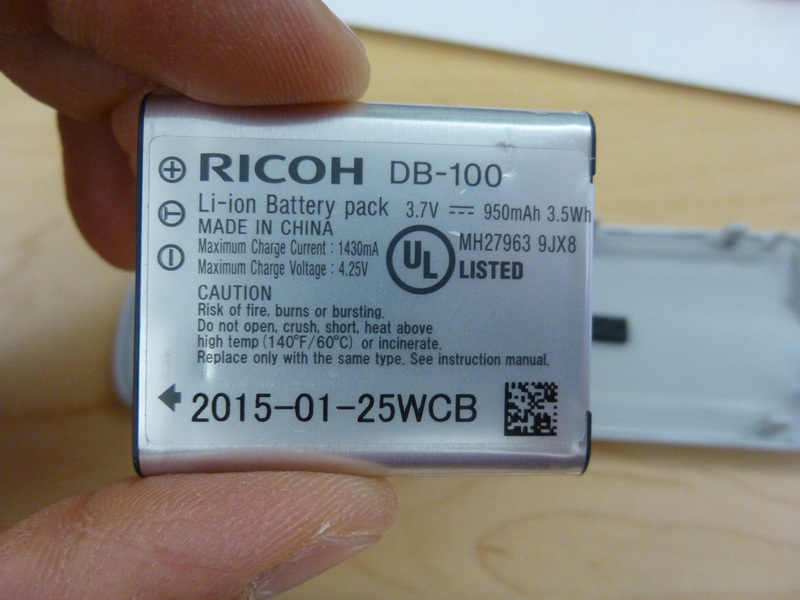 It is actually a Ricoh’s standard rechargeable battery product, which is also being used on CX5, CX4 and CX2 cameras. No wonder it looks a little over-sized for the slim panorama camera. I guess Ricoh could cut down the cost by doing so. Panorama camera is equipped with a RS-WC-201 wireless module from Redpine Signals. This module supports 802.11b/g and single stream 802.11n, up to 65Mb/s. Retail priced at about $65.00USD from Mouser. Same feeling for the battery that it is also quite big….but off-the-shelf means lower cost, why not? 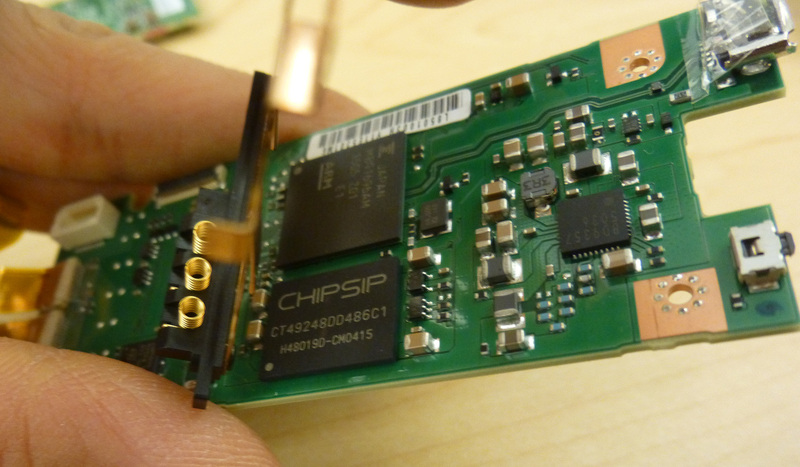 Unplugging the wireless module will expose the mother board and the optical assembly. The optical assembly, featuring two big fish-eye like lens in a back-to-back configuration, is well sealed and weighs a lot. 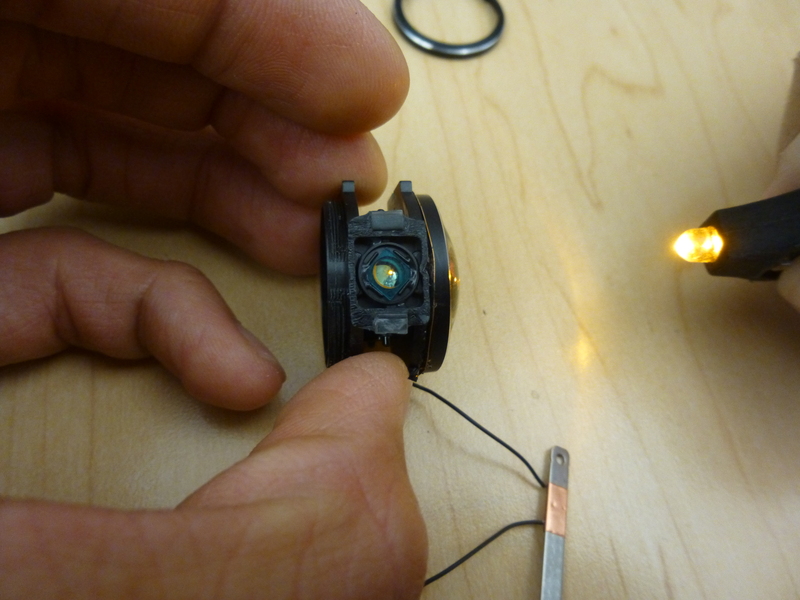 A metal strap was wrapping around the lens, and was soldered on to the mother board through black jump wires. I guess that was some sort of anti-static protection since the camera design made it very likely for a user to touch the lens. Although the lens is a passive component, prone to electrical discharge, the enclosed image sensor (I will show you later) may get affected if the lens takes the charge. The mother board is actually bigger than my first glance. It goes under the battery, covering the whole body except for the lens area. Battery contacts on the mother board. The battery is actually riding on top of the mother board. Another interesting discovery from the back of the mother board is that the Theta camera is utilizing a 4G micro SD card as extra storage. 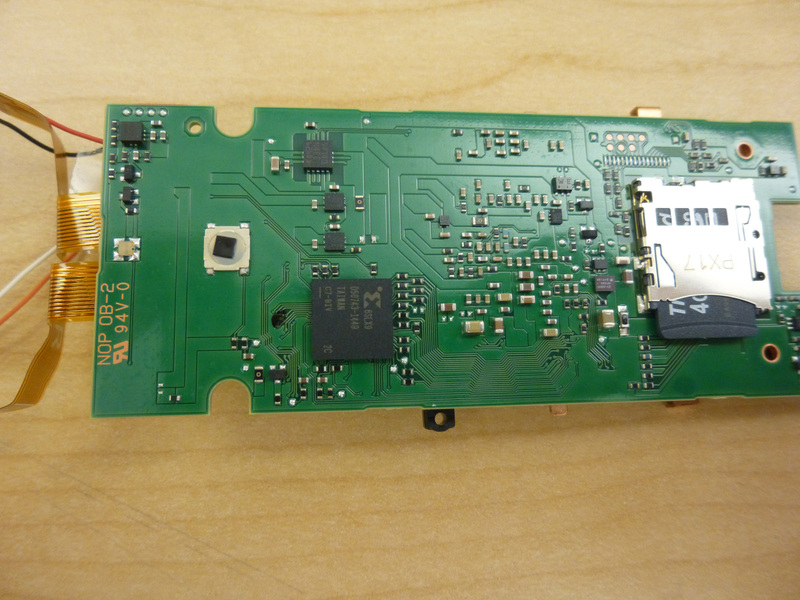 Spartan-6 FPGA and 4G micro SD card on the back of mother board. 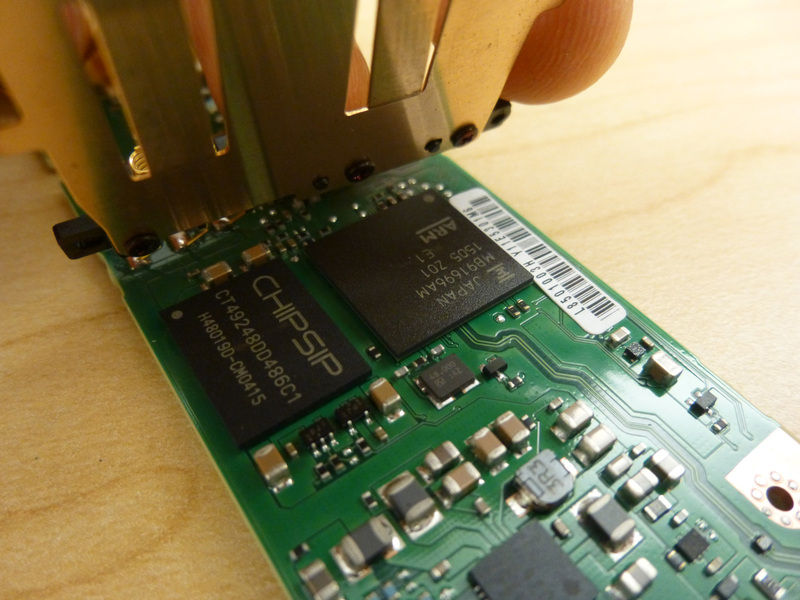 A piece of metal shield covers the ARM processor and the memory chip. The ARM processor is Fujitsu Milbeaut Image Processor MB91696AM, equipped with a dual-ARM core and built-in H.264 codec that supports Full HD video. This processor seems to be 4~5 years old already, its maximum of 5.5fps at 20MP doesn’t look too fancy on today’s market. That’s probably part of the reasons why Ricoh has released a new generation: Ricoh Theta S. The memory chip from CHIPSIP model CT49248DD486C1 is NAND(1Gb)+DDR3(2Gb). So my question is, if the storage size could be easily increased by using a bigger NAND chip, what is the necessity for an add-on micro SD card? Maybe it is easy to make models for different memory size? Metal shield covering the ARM processor and memory chip. The Xilinx Spartan-6 FPGA, the dual-core ARM processor and the memory chipset make the image processing engine for the Ricoh Theta camera. What makes it different from all other cameras is the unique optical/image sensor assembly that is capable of capturing 360° panorama photo. 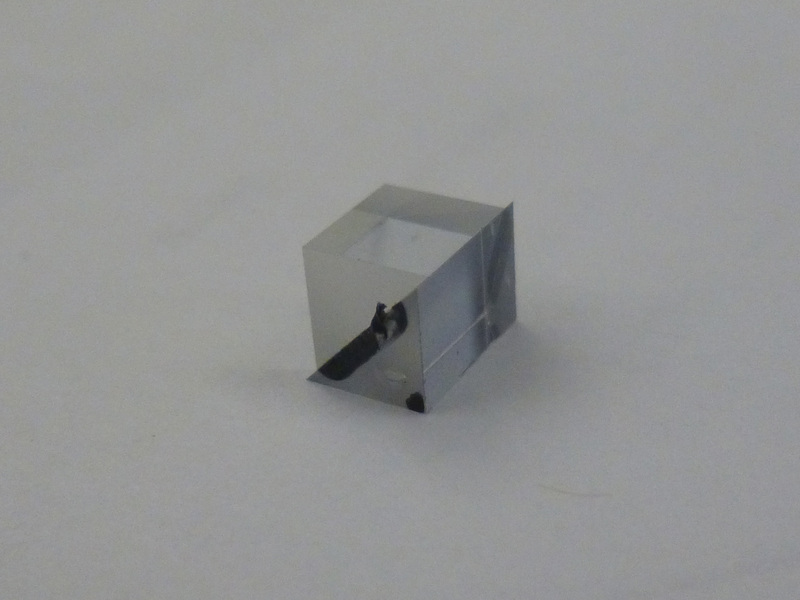 Side view of the optical / image sensor assembly in a compact package. 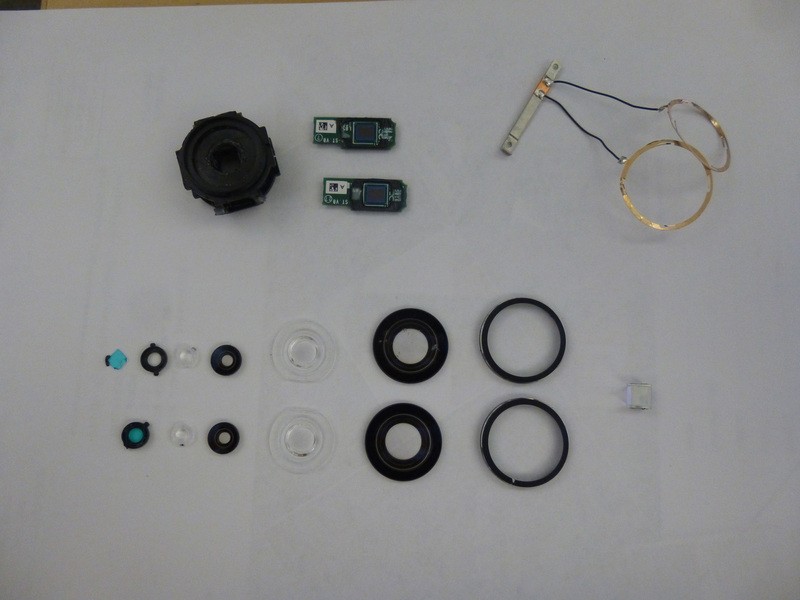 Top view of optical / image sensor assembly in a compact package. 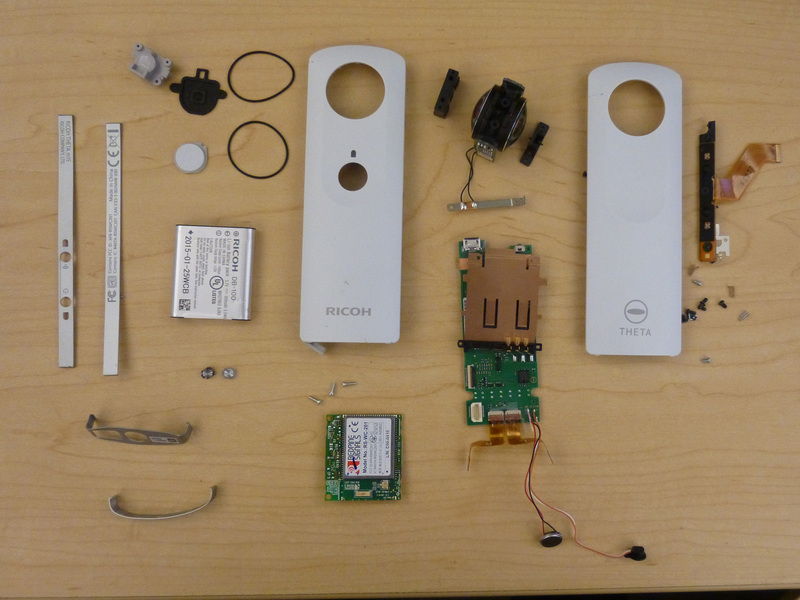 I took the photo below as I though this would be the end of my teardown work of the Ricoh panorama camera. But I was wrong! Please read on as more interesting discoveries are ahead about the well engineered optical / image sensor assembly. 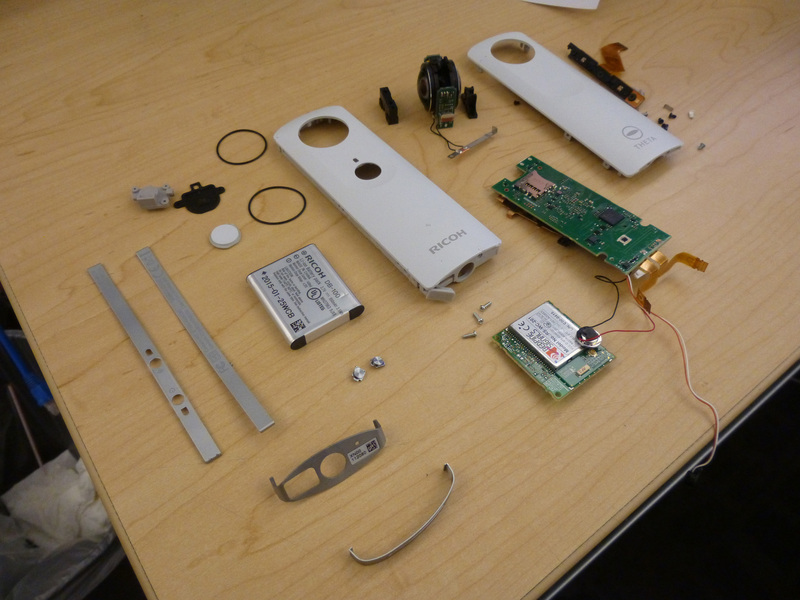 Disassembled Ricoh Theta Panorama Camera. The two circuit boards on the top and bottom of the optical assembly are actually the image sensor boards. I didn’t realize this until I further tear down this assembly. It was hard to image how a sensor is not directly behind a lens, but on the side looking through a diagonal mirror. What a smart design! Since the image sensor is no long taking up the space behind the lens, the back-to-back dual fish eye lenses could get as close to each other as possible. This, presumably, will leave a smallest as possible seam between the two 180° panorama photos. I guess this would make software engineer a much easier job to stitch the photos. 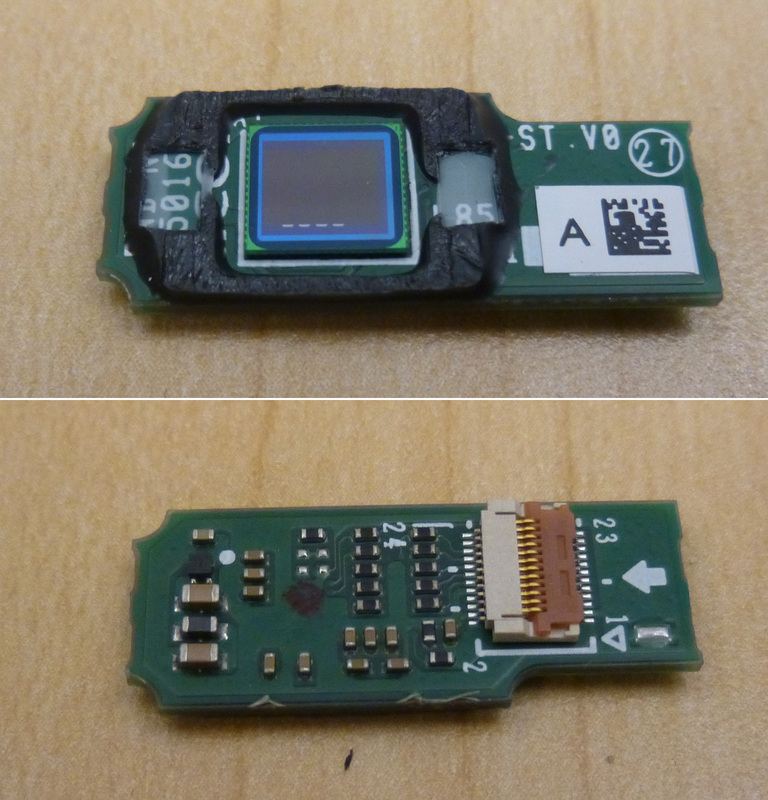 The optical / image sensor module was so well packed that it took me and my colleague some serious efforts to open it up. 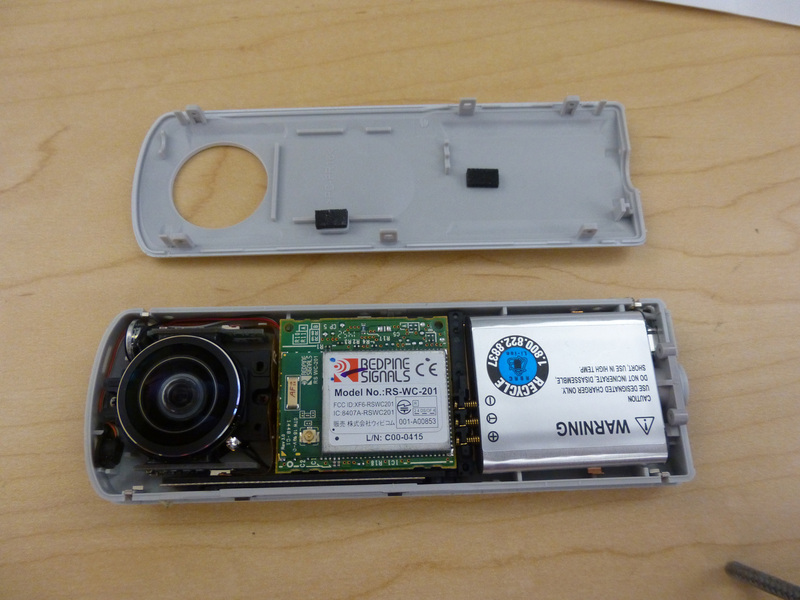 I noticed that some glue was used for the packaging, so the teardown of this assembly is an irreversible process. It was causing permanent damage to the assembly. So think twice before you try this. 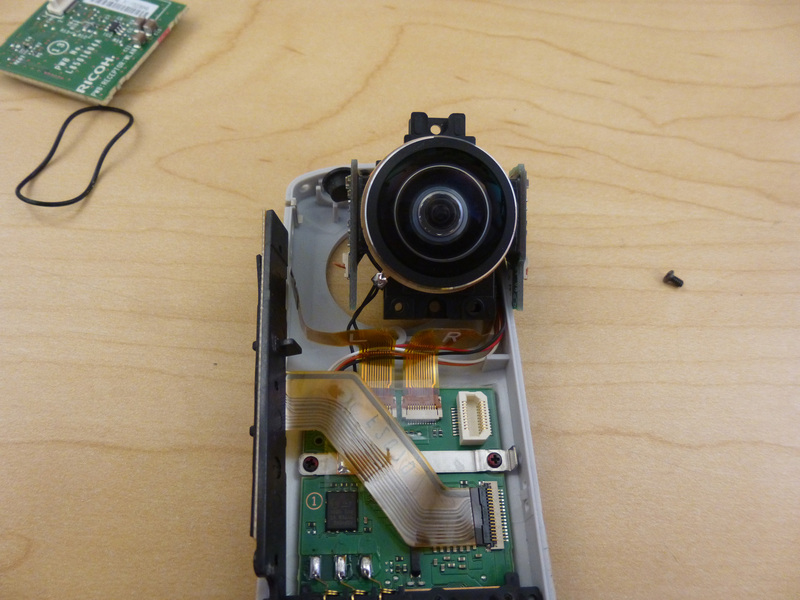 The image sensor got knocked off first. I wasn’t able to tell its maker or the model number. Given the limited number of pins on the connector, I guess it is a rolling shutter sensor. 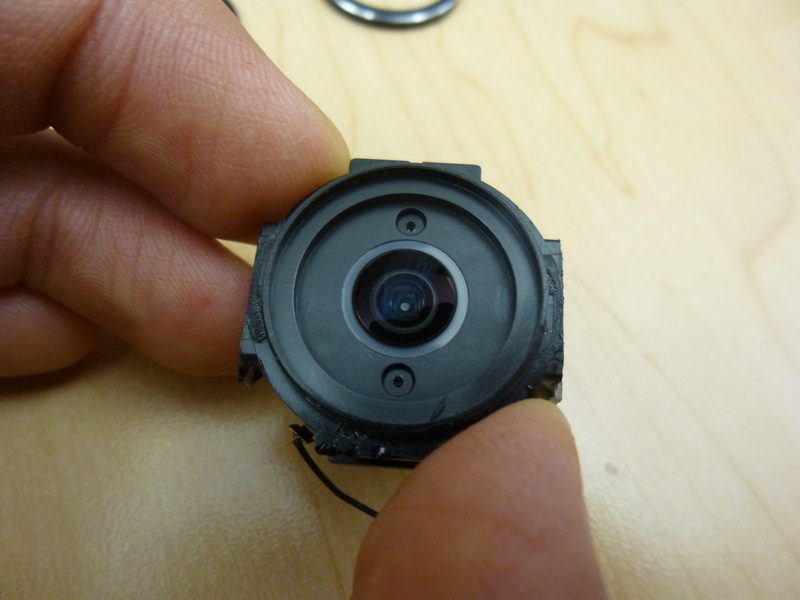 Top and bottom view of the image sensor. Once the sensor was removed, I was able to prove my assumption of its right angle optical path. As you can see from the photo below, I shined some yellow light on the right side, and the color showed up on the top. Same thing happened on the left side where the image was reflected down. There must be some sort of double-sided mirror placed in diagonal direction. Images from sides of the Theta panorama camera lens are reflected up and down to respective image sensor. 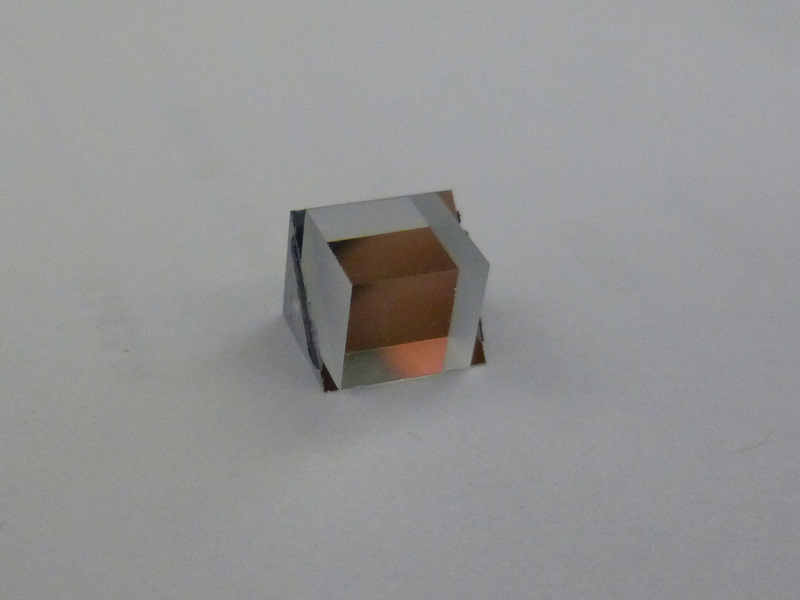 After the out-most convex lens was gone, we were able to take a further step into the heart of the optical module. But we were stopped by another piece of lens. After another desperate digging, knocking and poking, the 2nd lens was finally gone. 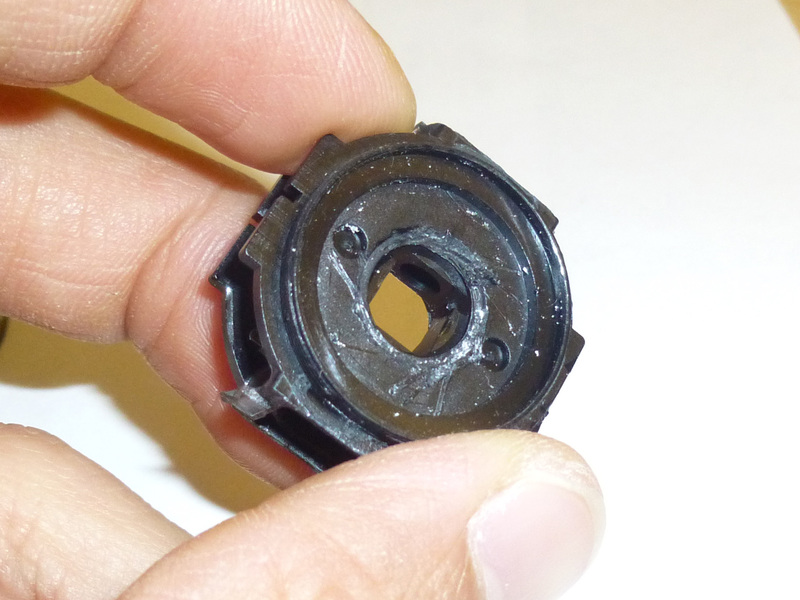 And the core of the optical module was just a friction of an inch away. Lens module stripped to the core. 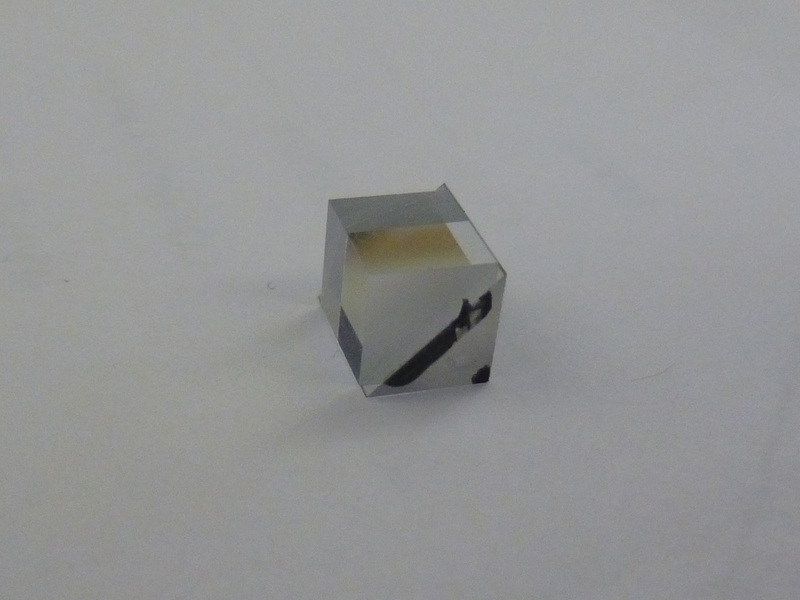 Finally we were able to grab the core: a beam splitter like cube that is made of two prisms glued together, forming a double-sided mirror on its interfacing surface (45°). Theta Panorama Camera mirror cube. 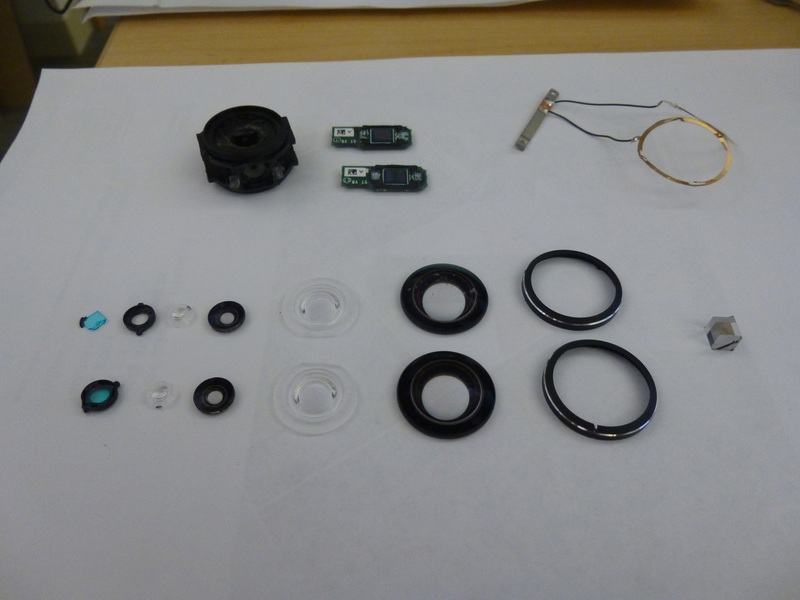 Here is the photo of all the parts that were ripped off from the optical / image sensor assembly. DIY, how to build your own cantilever sliding gate (8) – Mount the fencing board! Drill pilot hole before notching. Try keep the hole perpendicular to the tube. The one with yellow bulb was just reworked.